The Trieste property is located within the Trieste greenstone belt into the more prospective gold-bearing terranes exposed in Quebec near the boundary between the La Grande and Opinica subprovinces in the James Bay Territory, less than 60 km NW from Stornoway Diamonds Corp.’s Renard mine. The Trieste property, owned 100% by Stelmine, consists of 126 claims forming an area of 67 km2. In 2018 a channel sampling carried out on a chloritized amphibolite rock at proximity of a silicate/oxide iron formation exposed in the eastern sector of the property yielded a gold value of 2.81 g/t on 1 m. The assay corroborates the 1.10 g/t Au concentration obtained in 2017 by Stelmine on a composite sample collected near the iron formation (Figure 1). 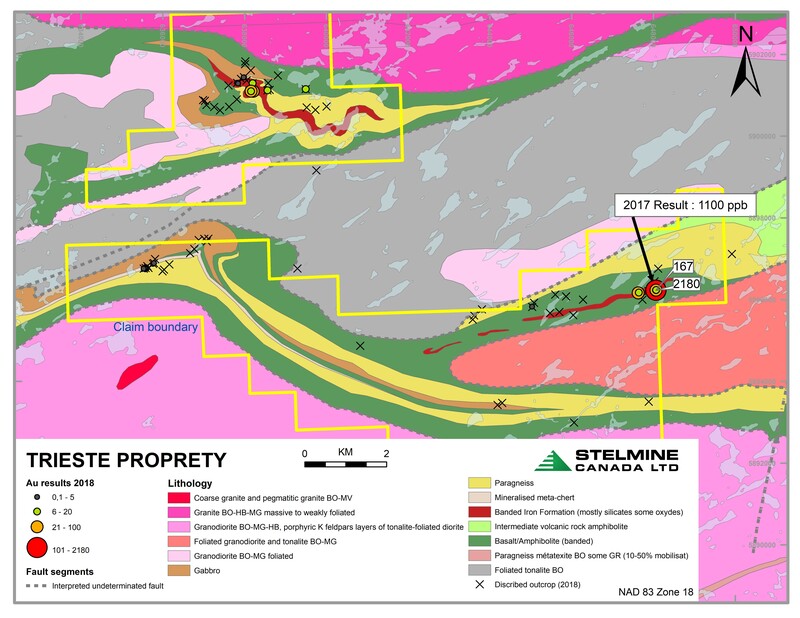 In 2018, Stelmine geologists completed geological mapping of the property accompanied by grab and channel sampling. The exploration work identified folded magnetic iron formations (oxide and silicate facies) interbedded with metasedimentary and mafic to intermediate metavolcanic rocks (amphibolites). Gabbroic sills are associated with the amphibolite metavolcanics. The metasedimentary rocks consist of paragneiss and migmatized paragneiss with metachert/quartzite forming part of the Solomon Fm. Mapped plutonic rocks consist of granodiorite, tonalite, granite and pegmatitic granite. Gold mineralization occurs in sulfurized amphibolites near iron formations containing magnetite, grunerite, garnet and sulfides (pyrite, pyrrhotite, arsenopyrite and chalcopyrite) and are cut by sulfide-bearing quartz veins. The iron formations display oxide and silicate facies and is interbedded with chert.